How do adults learn and develop? How can adult learning become a living, growing process? Based on the application of the 'seven life processes', Coenraad van Houten has successfully developed the methods of 'Vocational Learning' (Awakening the Will, 1999) and 'Destiny Learning' (Practising Destiny, 2000). Here, in the culmination of his research trilogy, he presents a new path of adult learning which he calls 'Creative Spiritual Research'. Based on the inner spiritual path of the individual, this is a method that relates to esoteric schooling, thresholds of consciousness and human creativity. 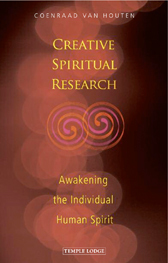 Part One of Creative Spiritual Research features guidelines and exercises for individual practice, whilst Part Two focuses on the general schooling path as a preparation or precondition, opening the inner space needed for research as well as a questioning attitude. COENRAAD VAN HOUTEN was born in the Netherlands in 1922. After studying Chemistry, Economics and Social Pedagogy, he lived and worked in Holland, Indonesia, Hong Kong and Britain as a manager in business, as a consultant, and as the director of the Centre for Social Development (which he co-founded). He has developed specialist programmes and seminars for educating adults, and presently advises organizations on training programmes. He is the author of Awakening the Will, Practising Destiny, The Threefold Nature of Destiny Learning, and is the co-founder of the New Adult Learning Movement.